Giving money is becoming a more popular alternative to buying a gift item for a couple, so here are few believes around the world about monetary wedding gifts. Most to-be-weds would agree that it would be nice to start off their married lives with a little extra in the bank. In the Nigeria society, guests traditionally gave gifts you could wrap but cash gifts and honeymoon gifts are now growing gradually (check out our Premier+ Wedding Catalogue where couples can add non-traditional gift items and experiences to their registry). For some cultures around the globe things are a little different. In many cultures, money has and is routinely given as a gift to brides and grooms, this is sometimes in addition to the giving of other gifts. Spaying of money is an intrinsic part of wedding receptions parties in Nigerian. Here, we’ve outlined how various cultures around the world give money to couples on their wedding day. In China, serving tea is a sign of respect. A traditional tea ceremony, called cha tao, helps to mark life’s milestones and celebrations including weddings. In Chinese weddings, the giving of money is linked to that special tea ceremony. Here’s how it works: Near the end of the wedding day, a Chinese bride serves tea to her new in-laws. As the tea ceremony begins, the bride kneels in front of the people she will serve, who are seated. She serves the tea in a specific order, starting with the groom’s parents and moving from the oldest to the youngest member of the groom’s family. Today, brides and grooms of Chinese background often visit each table at their reception to toast their guests. After each toast, the guest may choose to offer money envelopes to the couple. Money is a very common gift in Japanese weddings. The groom’s parents traditionally give the bride’s family money in ashugi-bukuro, or special envelope. The envelope is elaborately decorated with gold and silver strings twisted and tied into a decorative knot. Japanese tiles say that the knot is supposed to be impossible to open. The amount inside is usually quite generous three months of the groom’s salary or a set amount of 500,000 yen (about $5,000). Most grooms don’t get to keep the whole amount, which is seen as a family-to-family gift. But the money giving doesn’t stop there. Guests also give cash gifts to the bride and groom. The gift-giver’s name and the grand total of the cash inside is written on the outside of the envelope. If you’re attending a Polish wedding, don’t forget safety pins and some cash that is, if you want a dance with the bride. At a Polish wedding, guests pin money on a bride’s gown to get the chance to dance with her. Usually, the money is used to fund the newlyweds’ honeymoon. 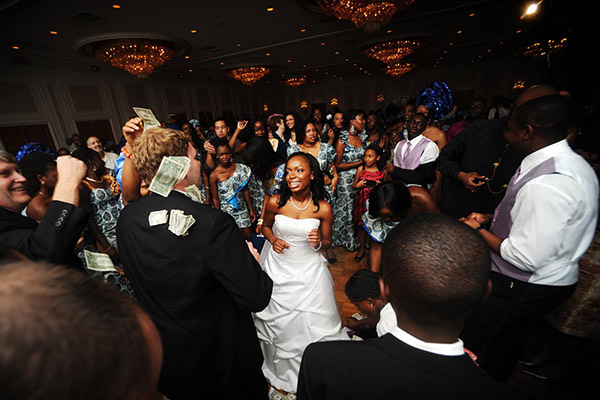 In addition, guests may form a circle around the bride and toss money into her veil. Sometimes the maid of honor collects money in her apron. An Italian bride may carry a special bag at her reception. It’s called la borsa, and as part of a custom called buste (meaning “envelopes”), guests place envelopes with money in the satin bag. The money is used to help cover wedding expenses. Italian families often ask an older relative to hold onto la borsa during the reception.